We have a huge playground with dozens of dive sites in the surrounding area, we always try to give our guests a diverse experience with different types of dives. We dive both in the fjords and out on the coast, both less than half an hour away with our comfortable boats. The Gulen Highlights is the package that will give you the most variation on the diving, and it is also a popular choice among our guests. This package offers some really good highlights. You get to dive our best wrecks, which is so unique with its amazing history. 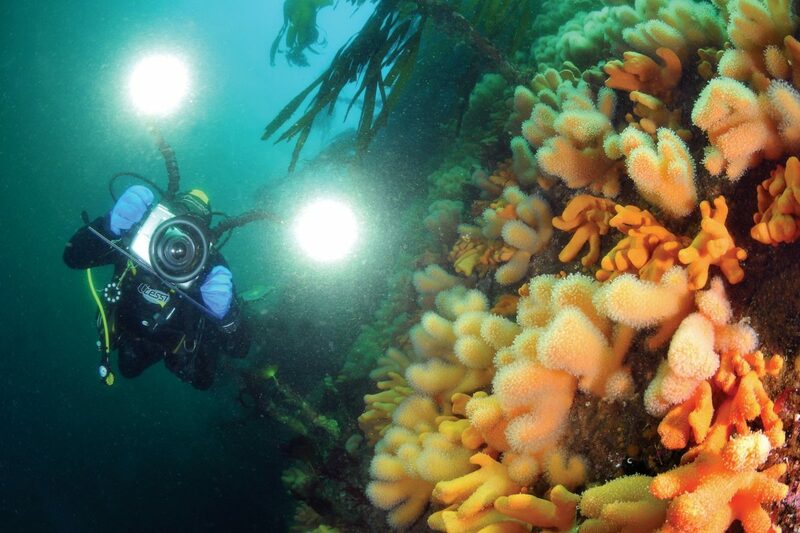 Diving in kelp forests, with canyons and channels. Diving with stingray's and 1000m with soft coral in a furious driftdive. Also diving on our amazing macro reef. Bring your friends or come alone, we promise you a breathtaking dive experience. Are you a photographer or like to shoot, you have unique opportunities. We have an average viz water at around 15-18m, where the winter months December January and February offers up to 35m. detailed explanations before dives will give you the correct information needed to choose the right lens etc. We offer packages with diffrent amount of lengths of stay by default, but we are flexible if you want to make changes. If you want to ad extra dives or change type of dive we will help you with that when you are with us in Gulen, so need to do anything before arrival. Use our feedback form if you are unsure or have any other questions. When booking please be advised that you accept the terms and conditions set on our Booking and payment page. Below you can find our rates and standard packages.